Do you work from home? I work from home. In fact, all of us here at Smart Office make this magic happen from the comfort of our own homes, because Web 2.0 is super awesome. Yes, being a stay-at-home worker definitely has its advantages–I am so glad that I don’t have to navigate the Chicago public transit system in the middle winter or get dolled up for the office every day, though it’s rare that I actually work in my pajamas. It’s hard to keep your mind on business when you’re wearing a bath robe. Keeping your mind on business is the biggest struggle of working from home, and the biggest obstacle to productivity is the blurring of lines between your home life and your work life. Nothing helps squash that problem more then a well laid-out, organized home work space –I say work space instead of office because you really don’t necessarily need a whole room, just enough space to work comfortably. No matter how much space you have, you need your work area to be a professional space to help you stay task oriented. You have to keep your personal life out of your office. The folks over at Suite 101 pulled together a few tips on how to do just that. I was pleased to see that I am already ahead of the game, having already incorporated one of their suggestions on my own: develop an organization system and stick with it. For example, I find I need visual reminders of important dates and tasks, so I just naturally began jotting notes and reminders to myself down on Post-It notes and slapping them on the wall above my computer monitor. Hey, it’s cheaper than a bulletin board, though it doesn’t look anywhere near as nice. That system probably won’t work for everybody, so Suite 101 offers some other solutions, including labeled bins and wall files. Though I work from home for an office supply company, I still picked up a few ideas on how to better organize my work area for greater productivity. Keep a separate set office supplies that no one uses but you, and you only use at work. As Suite 101 points out, nothing provides a handier excuse to procrastinate than not having the tools and supplies you need right at hand. That’s why you need to equip your home work area just as completely as an on-site work space. Invest in office supply basics such as scissors, pens and pencils, a stapler, paper clips, envelopes and printer paper. 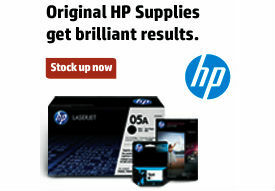 Funnily enough, you can get all of that quickly and for a great price at OnTimeSupplies.com! Ahem. Anyway, once you’ve got them, don’t steal your own office supplies! Don’t loan your pencil to your kid, don’t use your scissors to wrap gifts, don’t use any of your office supplies to complete household tasks. If you can swing it, reserve a printer and other office technology for your own work use, separate from what your family uses. Clean up the place from time to time. A messy work area is demoralizing and distracting, so clear away clutter regularly. That’s one reason I love my Post-It note system. After each little memo has done its job I can just toss them. Use your office supplies and personal organization systems–enter phone numbers and email address jotted on scrap paper and envelopes into your address book so you can throw that trash away and file your documents to get them off your desk. Also, remember that there’s no maintenance crew swinging by your office after hours, so go ahead and break out the dust cloth, empty your waste basket and clear away the coffee mug. You will be amazed by how much more focused you’ll feel and how much more work you’ll get done! Manage your time so you don’t neglect your work or your family. If you aren’t careful, you can fall into one of two traps when you work from home–working all the time, or never getting any work done at all. The best way to avoid either pitfall is to set a schedule, and stick to it! While you are working, don’t allow yourself to get sucked into non-emergency family matters. Maintain the integrity you had when you worked at an on-site location–don’t carry out personal conversations on the phone or through email while your are supposed to be working. At the same time, it’s important to preserve your personal and family time. After you’ve put in an honest day’s work stop working! When project deadlines loom over your head and you have to put in extra hours, make your family aware of the situation, schedule time with them after your work life is less hectic, and set aside time for yourself.